We are pleased to announce that both Broomgrove Infant and Junior School have been awarded a Certificate of Musical Excellence. We are one of only two schools in the country to have achieved this award. This achievement would not have been possible without the dedication, commitment and expertise of our music teacher Mrs Stacey Minshull. 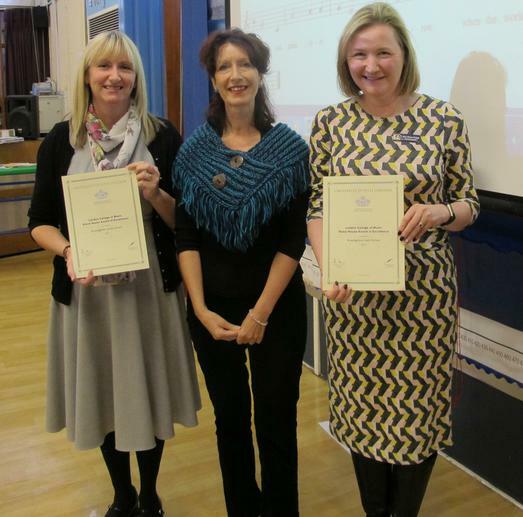 "This is a wonderful achievement, both Infants and Juniors are teaching Music to a deeper level and the musical foundation that the children are receiving is second to none. All the children in these two schools are taught to read, write and play music from the youngest age possible, laying a classical foundation for composition and notation skills that are way above the national cohort for their age groups . I am thrilled to see the Stave House programme being delivered so successfully and enjoyed by so many"
Forty five children were examined and passed Stave House awards (some pictured here). Ruth Travers presented 25 Level One certificates (5 Pass, 20 Pass with Distinction) and 20 Level Two certificates (9 Pass, 11 Pass with Distinction).